Which bathroom trends are going to last? Some interior design trends turn out to be fads, while others become tried-and-true standbys. So, how do you tell the difference? When redesigning your bathroom, it’s important not to fall prey to the expensive fads that fade in popularity within a few years. 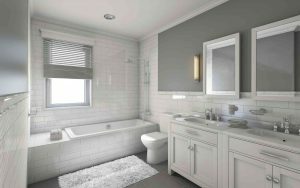 Here are a few popular bathroom trends that we think will be around for a long time to come. Remember the whirlpool tubs that everyone was clamoring to have in their bathrooms? Homeowners are finding that this is one of the bathroom trends that they just don’t have time for anymore. The tubs just become a big eyesore for homeowners who are too busy to use them. This is why more and more homeowners are opting for walk-in showers. Spacious walk-in showers are easy to use and very inviting. You don’t have to wait for the tub to fill up, and you can enjoy a spa experience with a customized shower heads and in-shower seating. Gorgeous natural stone or porcelain tile shower surround are ways to complete this luxurious atmosphere. The easy accessibility of the large walk-in shower also helps homeowners to age gracefully in their own home, making it a great long-term investment. You can’t have too much privacy in the bathroom! Since many couples use their master bathroom at the same time–whether to prepare for work in the morning or get ready for bed in the evening–it makes sense to add an extra layer of privacy. Concealing the toilet behind a wall or even in its own water closet will create a little more comfort to your master bathroom. Speaking of added privacy, how about a room in or off the bathroom dedicated not only for storing your clothes – but for changing as well? This will also help the early riser not to wake their partner who is sleeping in. You can even install a makeup vanity and customized lighting inside your walk-in closet so that you have a private area to focus on adding those finishing touches before going out to start your day. When the kids are being noisy and you’re feeling stressed, you can close yourself into the quiet privacy of your walk-in closet and prepare yourself for the day without interruptions. That’s a valuable addition to your bathroom that you won’t ever regret! Ready to get started on your next kitchen or bathroom remodeling project? Kenwood Kitchens can help. Since opening its doors in 1974, Kenwood Kitchens has made a name for itself throughout Maryland as a complete kitchen and bathroom remodeling firm. With showrooms located in Lutherville, Abingdon, Columbia or Annapolis, Maryland, Kenwood Kitchens is the place for all of your kitchen, bathroom and closet needs. We’re also featuring a special Wood-Mode savings event until February 24th, 2017. Don’t hesitate to give us a call at (800) 211-8394. This entry was posted on Friday, January 13th, 2017 at 1:51 pm. Both comments and pings are currently closed.